Did you know that manatees were once mistaken for mermaids? Gloups had never seen a manatee and since we are so close to the park, we thought it would be fun to visit the Homosassa Springs Wildlife Park. We started our adventure taking the nature trail hike so that Gloups could see all the animals ($35 for whole family). Homosassa Springs Wildlife Park is home to a 55-year-old hippo that was born at the San Diego Zoo. Gloups got to see alligators, wolves, fox, birds, black bears, deer, bobcat and crazy river otters. There are four manatees that live all year round at the park and 100s that come in during the winter because of the warm springs in the area. Gloups learned even more info about the manatee at the Discovery Center, which had a skeleton, puzzles, and info about the area. We found out that you can swim or canoe with the manatee all year-long and there is a nice picnic area and a campground. 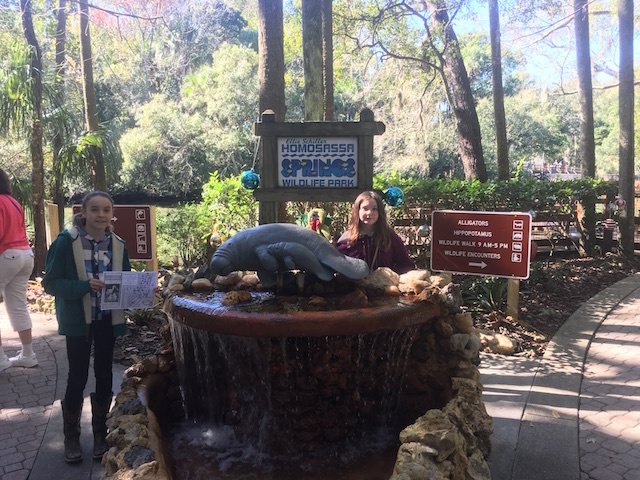 This entry was posted in Art/Music, Gloups Adventure, History, science, Unschooling and tagged Florida, gloups adventure, Homosassa Springs Wildlife Park, manatee, science, wild animals by Chrissie. Bookmark the permalink. Yes, it is sad. Especially in areas where the boats shouldn’t have their motors on! Near my mom’s house is an electric plant and the manatees pool there in the warm water during the winter months. Such a beautiful creature.